The conflict in Libya between pro- and anti-Gaddafi forces will continue to take its toll on communities long after the war has ended as long as hidden bombs remain scattered across public areas. Allegations that Thailand used controversial cluster munitions during recent border clashes with Cambodia have become the latest wedge driving tensions between the two neighbours. On a windy morning in southern Laos in November, a team of deminers built a makeshift bunker out of sandbags and piled the barrier around a tiny explosive. 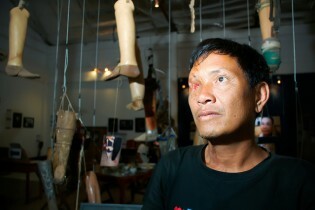 Eighteen-year-old Phongsavath Manithong rubbed his eyes with the back of his arms as he described how his life changed forever. A campaign to rid the world of cluster munitions has still to rope in the U.S. government, a major producer and stockpiler of the deadly payload, on the eve of a key global conference in Laos to ban its production and use. Thirty-eight countries will start observing the Convention on Cluster Munitions this Sunday, Aug. 1, after a rapid entry into force since the treaty was announced two years ago in Oslo. The five permanent members of the Security Council - the United States, Britain, France, Russia and China - are accused of facilitating the transport of conventional weapons and cluster munitions to countries where they could be used to commit human rights violations and war crimes. Human rights groups are urging the French government to adopt a law that would ban the financing of companies that produce cluster munitions, the deadly bombs that have killed or maimed thousands of civilians in the past 40 years. POLITICS: Cluster Bomb Ban to Become Law – Without U.S.
Just over a year after it was opened for signature, an international treaty banning cluster bombs received the final two ratifications it needed to become international law Tuesday. Tens of thousands of Gazans living in tents and damaged homes face a wet, cold and miserable winter as Israel’s blockade of the coastal territory continues to prevent the importation of building and reconstruction material. Leading advocates for lifting the nearly 50-year-old U.S. trade embargo against Cuba are hailing Congress's approval Tuesday of a general appropriations bill that eases - albeit in a mostly symbolic way - several restrictions on travel and sales to the Caribbean nation. When the United Nations talks of "Israeli-occupied territories", the conventional definition is that these disputed lands include the West Bank, Gaza Strip, East Jerusalem and the Golan Heights - all of them annexed after the 1967 Arab-Israeli war. As the European Union launches a probe into the conflict between Georgian and Russian troops in the breakaway regions of South Ossetia and Abkhazia last August - with much of the blame now being cast on Georgia for firing the first shots - thousands of civilians remain displaced and homeless at the start of winter. A dramatic decision to join a ban on most types of inhumane weapons was announced by Japanese Prime Minister Yasuo Fukuda at an international conference attended by 110 nations in Dublin at the end of May. On the last day of the conference, the Japanese government, which had wavered, said it would support the ban. Irish diplomats won plenty of kudos from governments across the world over the past week for brokering a ban on cluster bombs during an international conference in Dublin. It may seem ironic, then, that despite having a decades-old tradition of military neutrality, Ireland has deepened its involvement in the arms trade in recent years. Cluster bombs should be outlawed in most of the world thanks to an agreement formally endorsed by over 100 governments in Dublin May 30. After more than a year of contentious negotiations, diplomats from 109 countries meeting in Dublin agreed Wednesday on a treaty that would outlaw the use, production, transfer, and stockpiling of cluster munitions, which have killed and injured thousands of civilians over the last four decades. On this 40th anniversary of 1968, the year that for the United States was the apogee of opposition to the war in Vietnam, two new Off Broadway plays explore divergent ways that U.S. citizens protested - and ponder the best way to contest a senseless war.